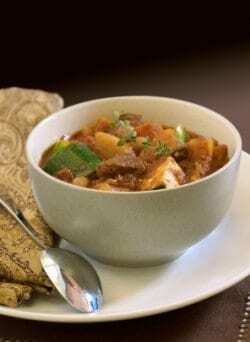 La Madeleine Lamb Stew is a recipe is Recipes from the Chef’s Kitchen. This is a television show in Farfax County Virginia. You can find more of their recipes at their website. La Madeleine Lamb Stew can be made at home. Add lamb cubes to very hot oil stirring once or twice. Let the meat brown for 3 to 4 minutes. Add garlic, onion, bouquet garni, tomato, salt and pepper to the lamb base. (Cook for 5 more minutes). 3) Add water, bring to boil then reduce heat to simmer (45 minutes). 4) Add carrots (cook for 5 more minutes), add potatoes (cook for 30 minutes). Add roux and peas. This sounds really good! I will try it soon.